Disclaimer: We cannot guarantee that the Specs/Price of Changhong Ruba 1.5 Ton CSDC-18DE Split AC on this page is 100% correct (Human error is possible). For correct Specs/Price always visit nearest local shop. 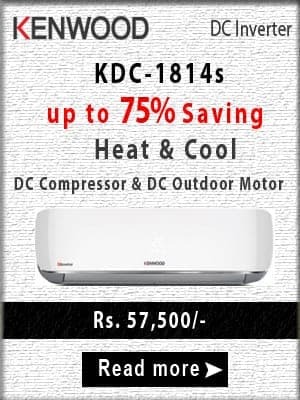 The Changhong Ruba 1.5 Ton CSDC-18DE Split AC price is valid in all cities of Pakistan including Karachi, Lahore, Islamabad, Faisalabad, Multan, Rawalpindi, Hyderabad, Gujranwala, Bahawalpur, Peshawar, Sargodha, Sialkot, Quetta. You can buy Changhong Ruba 1.5 Ton CSDC-18DE Split AC online in Pakistan and also from local shops from different cities in Pakistan. You can also avail the options of Cash on Delivery (COD) of this product from different online stores.